It's 102 degrees Fahrenheit in Houston which means, of course, that it's almost autumn. Ugh! It is so freeeeeeeking hot outside. What is there to do but look forward to cooler days, right? Halloween has to be just around the corner. Which makes me want to look back. To this picture. But I say we go with it. I was the first one in the world with a Princess Leia Halloween costume and if Antiques Roadshow ever asks, we're all sticking with this story. Got it? So speaking of Halloween, I've been busy getting Halloween books ready for my big fall craft show coming up in a couple of months. You, however, don't need to wait because you (yeah, I'm talking to you) can grab some of these nifty books now on Etsy. Check out that ominous endpaper! It sparkles! And speaking of sparkling, the purple, glittery trees on these creepy endpapers shine! ...your creepy friend who wears a big, brown bun right above each ear. She'll get the idea. I love your books. I was telling Bill that I didn't know the images I had seen of the READ were yours. I had run across them on on a couple of websites and wanted to include it in one of my Teacher Professional Development Conferences as part of the logo. The name of the Conferenc was the READ, White and Blue, but I thought it was a stockphoto copywriten picture so I never tried to use it. I think that is hillarious. 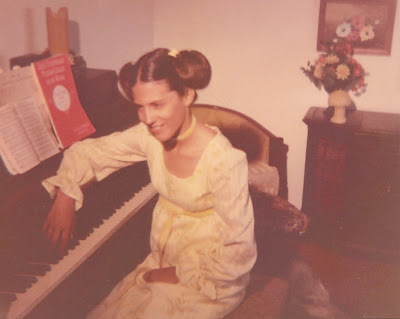 I love your Princess Leia outfit, and at least you stayed with Piano enough to actually do something with it. I lasted 6 months. :) Never could get my left hand to want to work properly, as it different from the Right. LOL. Anyway, these are great! I love em. If you ever get the chance I'd love for you to show me how you do it. You've got way better patience than I. Thanks for sharing the books. Thanks, Bambi! I'm glad you like my books! "Read" is a pretty common word for all book folders, so you may have seen someone else's work on those websites. It's kind of like learning to make your computer say "Hello World!" whenever you learn a new programming language. Everyone learns it first. What a lovely picture :-) You would have looked great playing basketball with that double bagel hairdo! Jane Austen meets Princess Leia - love it! And I love all your scary, creepy, Halloween-y books too.